inKLEINations: Come and join us! We gathered around an early evening backyard campfire at the home of brand new friends in Idaho. Song time was about to commence. As the guitar was being tuned, we asked our hosts if they knew any Petra songs. Eyes lit up, and a comment about not having heard a Petra song in years was made. At evening devotions with friends in southern Mexico, while sharing favorite songs, our kids unanimously declared we must sing “Grave Robber”. And so we did. And now it is one of our friends’ favorite songs as well. Powerful words, powerful music, powerfully sung. It only seemed fitting to us as newlyweds back in the ‘80s. Songs by the christian music group Petra held common themes of valuing what God values, not being deceived, having faith in an almighty God, depending on him, praying. These were ideas with which we were not raised. As we wore the dreaded “horse hoof” sounds into the cassettes by repeated play, the words and lessons were being impressed on our hearts. It was a means God used to encourage us in truth that is despised by the world. As children were added to our family, many of the analogies in the songs took on greater depth: struggling with our own lack of self-discipline, the need to shift priorities, to care more for pleasing the Lord than pleasing men. As our children have grown, they have learned and loved these songs as well. 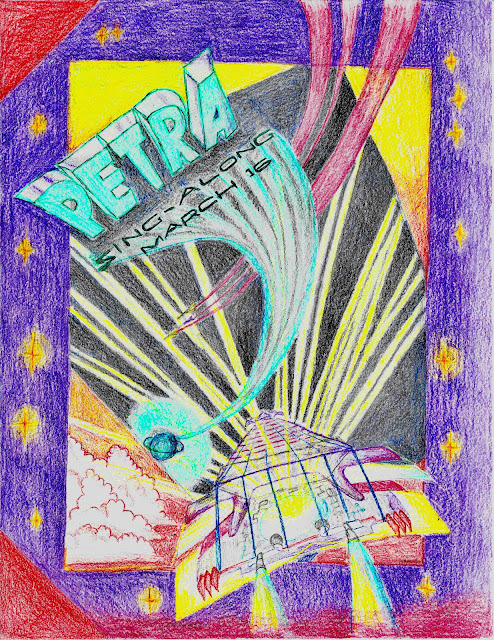 Petra put to music many truths, priorities and promises which they have been blessed to know from their earliest days. We love figuring out how to play and sing old favorites. And so the idea grew...a Petra Sing Along night! Our gracious friends at the Family Vision Library are excited to host this special evening, so we want to get out the word. Whether these songs are like old friends to you or you would just like some fresh encouragement from days gone by: if you are in or near the Saint Louis metro, please come and join us! You won’t find the polish of seasoned road warriors, but we hope to make noise that somewhat resembles some of our favorite songs. We will project the words and everyone can sing along. We pray it will be a night of fellowship and refreshing as we encourage one another and praise the Lord with melodies from our hearts. Please join us on Friday, March 16, at the Family Vision Library. Bring snacks if you would like. And tell your friends! It would be fun and helpful to RSVP and suggest some of your favorite songs for us to consider as we compile our song list.